Three manual keyboard-stack from Horton Chapel, Epsom. These keyboards come from the organ in the Chapel of the large London County Council Mental Hospital at Horton, nr. Epsom, Surrey. 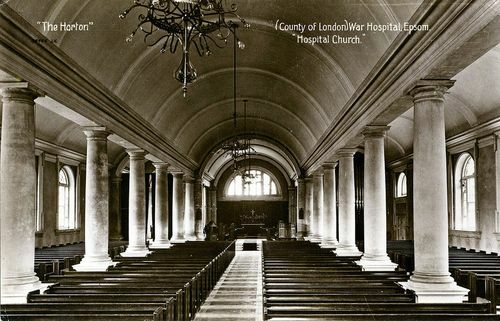 The hospital was opened in 1902 and closed in 1997. The chapel has been empty ever since - becoming a target of vandalism. It is now being restored as a community arts centre. "This organ is sadly beyond redemption as a musical instrument and it is clear that some while back, it was stripped almost entirely of its pipework and windchests. Sadly, this has made identification much more difficult. The suspicion is that the organ is possibly by Gray & Davison, built around 1870. A tuner's address plate from the firm of Rushworth & Dreaper is mounted to the console. " 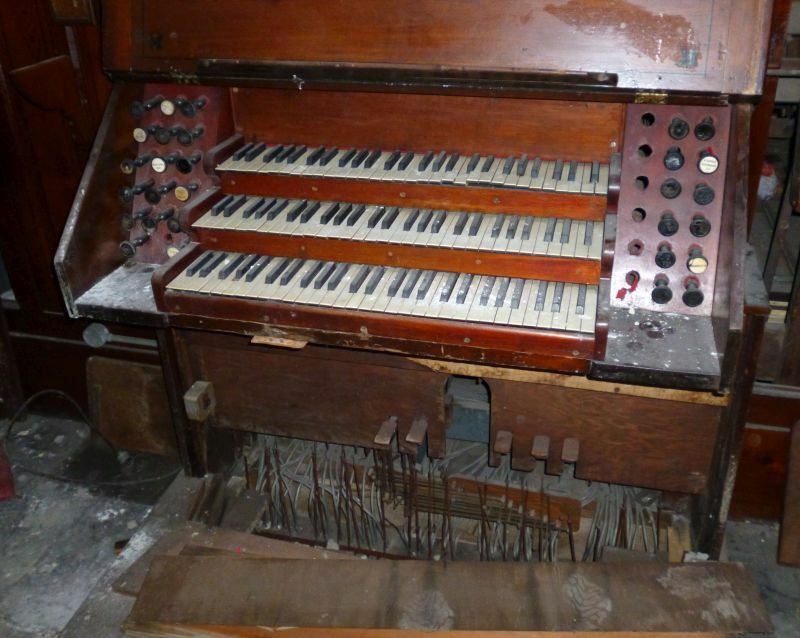 The organ was well beyond repair. All that remains is the decorative pipework, some of the larger wooden pipes with their chests and much of the original tracker action. The keyboards are covered in plastic for the naturals and ebony for the sharps and flats. I understand that plastic in the form of celluloid was first developed in about 1870. This probably means that the keyboards were made for the instalation at Horton Chapel in the early 20th century. The keyboards show many signs of repair though, so it may be that the Horton organ used renovated rather than brand new keys. The name 'William? Hoskins' is scratched on the lead of the swell key weight. A William Hoskins, 31, 'pianoforte maker['s] fitter up' was living in the St Pancras area of London in 1891. In the same year a Thomas Hoskins, pinanoforte [sic] Key finisher, lived in the Marylebone area. The suggestion in the Ebay sales information that the organ was by Gray and Davison may arise from the surviving bellows weights which are marked G D. The company was founded in London by Robert Gray in about 1774. In the late 1830s John Gray took Frederic Davison into partnership. For many years the company had premises in Euston Road. The company closed in 1973. Gray and Davison were responsible for many well-known instruments including one at the Crystal Palace. All three keyboards were very dirty: they were covered with a century's collection of dust, finger-grease and plaster debris from the decaying ceiling. The keys of the upper two keyboards - the great and swell manuals - were rather stiff with friction at both front rail and balance pins due to light corrosion of the pins. The choir keys were completely jammed. On investigation evidence of a liquid spill was found in the lower keyboard which had badly rusted the front rail pins and these had fused with the cloth bushings on the keys. This manual will need to be rebushed. The keys were removed and brushed free from dust; the coverings (the white plastics and the black ebonies) were then cleaned with a soft cloth and a little washing-up detergent. The balance pins and front pins were cleaned and polished. The frame was dusted and wiped with a damp cloth; The original polished finish was revived with a wipe of french polish. This process was repeated for all three manuals. The keyboards show signs of previous repair. Several of the black keys have leather patches protecting repairs around the front pin holes. Many of the keys have tiny metal wedges driven in around the balance pin - as if to tighten the balance pin hole. Several black and white key coverings had come loose. These were re-glued. Age and dessication had caused damage around the front pin holes of several black keys. This was repaired. Back rails and support rails for electronics will be added. The frames will be extended so as to completely enclose the keys and provide support for the extra rails. Originally the keyboards relied on the weight of the tracker action to hold the keys in the correct playing position. As this is no longer present, the keys have dropped down onto the key-bed and will require springs to be added to hold them in their proper positions. This consists of two parts; printed circuit boards with a switch mechanism to capture key presses and an Arduino microprocessor to convert key presses to MIDI messages. I will be using an opto-electronic system in which small phototransistor transmitter/receiver units on the pcbs are triggered by shutters attached to the underside of the keys.